We are passionate about serving and inspiring you. This page tells you a little about how we can help you. Connect with us to discuss further. Cash flow and enabling some of your income to be effectively saved and invested is so important in building wealth. We assist you in this process and in keeping accountable. We help you cut through the complexity and make sound investment and planning decisions in a collaborative manner. We assist you in having enough for your retirement and in using superannuation as a vehicle for long term investment. One of our niche specialities is helping lawyers with their planning needs and we have various service packages for those in the profession. The foundation of planning and investment is protecting risk where you can. We help you do so in a manner that is appropriate to you. An oft forgotten area, we facilitate you getting your house in order and in planning to have the right assets provided to the right people at the right time. Because we think you will be pleasantly surprised! Our advice process is tailored to helping us understand you and provide advice that is tailored to your situation and objectives. We work with you to understand where you are now, where you would like to get to financially and how we can assist you in more efficiently getting there. 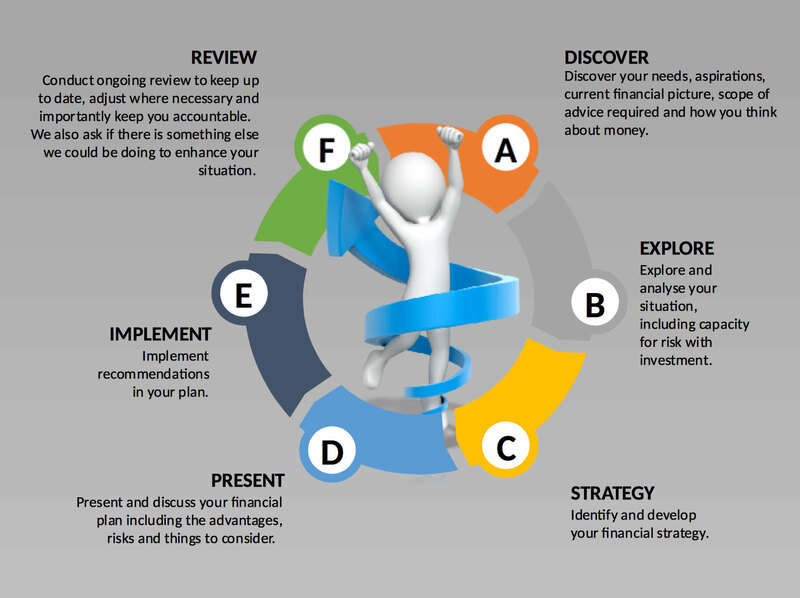 The advice process moves through distinct phases of client discovery and requirements, strategy development, advice presentation and discussion and advice implementation. For most, ongoing review will then follow, being an important part of the puzzle. The illustration below shows the steps our process takes. Should you wish to know more about our service offering, you can read Inspired service further information.